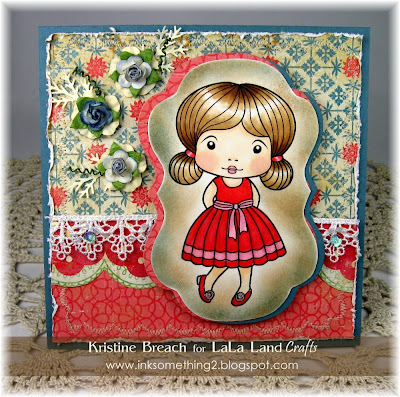 La-La Land Crafts Inspiration and Tutorial Blog: Shabby Chic ~ I Think?? This is one of those cards that started out one way and completely took a turn half way through, LOL. I think I went a little "sponge-happy" but any which way, I think I like the outcome. This new Marci is just the cutest that it's hard to go wrong no matter what you do with her. These new stamps, Fancy Marci and Formal Luka are still available (for a limited time only) AS DIGIS right HERE on this blog!! Want to WIN some of these stamps?!! Be sure to upload your LaLa cards throughout the month ... you just might win our next monthly Customer Appreciation Prize!! Chic yes! your heavy sponging looks incredible, and I love the shine you created for her hair! really gorgeous card, another beautiful project! Beautiful card. I love Marci's shinny hair and the colors you used for her dress. You paper selection is awesome. I like your sponging. Oh my gosh...I just totally love this card Kris! Her hair is beautiful as well as the coloring and sponging!! Oh yes, very chic !